How To Clean Your CCTV Camera Lens | Calgary Alarm Inc.
Like any other glass surface that’s outside, a CCTV camera lens will eventually require cleaning so that it can perform its best while protecting you and your property. Luckily it doesn’t require frequent cleaning nor is it hard to clean. CCTVs are meant to record for hours at a time, and the longer the recording time, the more memory it requires to store. In general, CCTVs don’t need to have high resolution to be effective, so your security system will find a good compromise between storage demands and capturing information. Like many other cameras, glass that has been exposed and used for a while will develop its own character from things like scratches and dust that is trapped on the inside. Although the effect is cumulative as time goes on, cameras can continue to function due to depth of field, which for most CCTVs use in home security systems, capturing distances from the front lawn to the front door. Your camera will ‘look’ past particles and scratches, although the imperfection will result in a slightly blurred view. Most cameras are mounted in hard-to-reach areas to prevent tampering and for a better vantage point. You’ll need to grab a step stool or a ladder to get closer access to the cameras to wipe the glass with your hand. Clean water to rinse off most of the dirt and large debris. A cleaning solvent that won’t leave streaks. Dedicated parts of cloth or different cloths for rinsing, drying, and polishing. Sometimes with microfibre cloths, scratchy materials can embed themselves into the strands, and once they’re trapped are difficult to remove. You can avoid scratching the lens by examining the cloth ahead of time and also by applying gentle pressure during the process. If you feel like using soapy water for the pre-rinse, make sure your solution contains minimal soap since residue is a magnet for dirt. Visible scratches start to happen between 20 to 200 microns in depth. There are special polishing creams that can be used to manually fix shallow scratches. 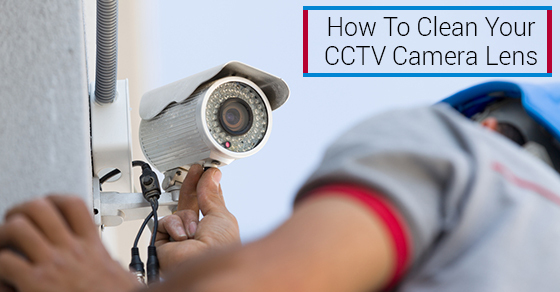 Whether you have a bullet or dome CCTV camera, most will be positioned in a way that requires minimal cleaning.